Hello Friends! Happy Tuesday! I'm on a birthday card binge and today, I have two more to share. 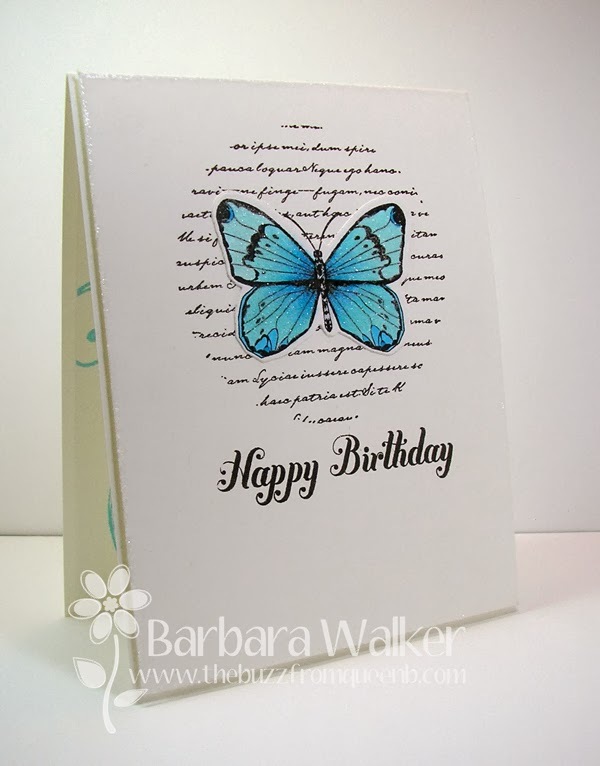 I just love this butterfly stamp and coordinating die! I stamped the butterfly onto white card stock and colored it with Copic markers. Then I die cut it. Next, I applied a thin coat of glue to the image and covered it with crystal glitter. I chose crystal glitter because I wanted sparkle, but no iridescence. It looks sooo pretty in real life. Well, I got carried away and applied glue around the edges of the card stock panel and then sprinkled on more glitter! We can never have too much sparkle, right? LoL! Anyway, go ahead and click on the image to enlarge it, maybe you can catch a glimpse of the sparkle. 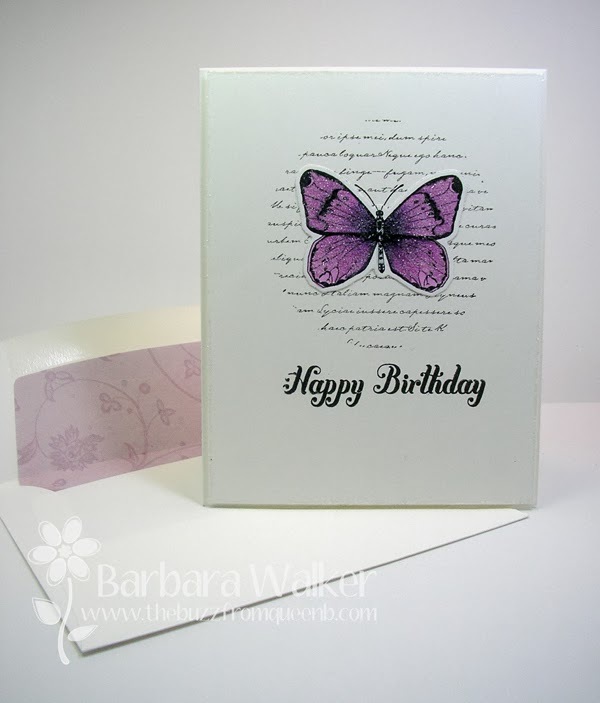 After I glittered the butterfly, I adhered it onto the panel right on top of the stamped circle text image. I added a Happy Birthday greeting, then mounted the panel onto the card base with dimensional adhesive and that's all there was to it! I also made one in purple. And with this one, I created a coordinating envelope. That's it for me today. Thank you so much for stopping by. I appreciate the visit! patterned paper: Spring Stack(Brenda Walton)-this is sooo old it's not even funny. Wow, Barb, these are gorgeous. LOVE the colors in the butterflies and that bit of sparkle. Just the absolute right amount. They are so pretty on top of the text and how neat to add the glitter around the edge of the card, too. Beautiful! Just stunning! I love the sparkle and the text in a circle. Love them. Now I have to buy more stuff. Your did a great job coloring the butterflies. Very pretty.